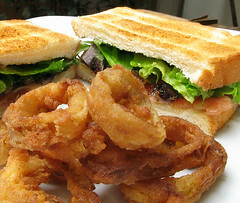 The onion rings are some of the best I've ever tasted, and are very easy to make. Just mix together 1/3 cup of milk, 1 egg, and a pinch of salt and black pepper. Slice 2 large white onions into rings and soak for 30 minutes in the egg mixture. Break open some pancake mix (I used Maya) and pour about 100g onto a plate. Dip each onion ring into the breading (you don't have to worry too much about excess breading) and deep fry in hot oil until golden brown. Drain on paper towels. Load the onion rings into a loaf pan, forming a very loosely packed loaf, and bake in a preheated 205°C (400°F) oven for 10-15 minutes. I ate mine with barbecue sauce. YUM!